Out of stock since Friday, 3 August 2018. Due back soon. Made from the finest quality leather, this head collar has 1" bridle leather and a soft under padding on the nose and headpiece. Brass fittings, an adjustable chin strap and clip throat fastening. Made with English leather. 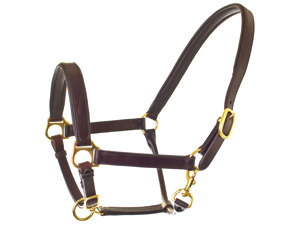 There are currently no questions for HyCLASS Leather Padded Head Collar - be the first to ask one!